This chapter is dedicated to the optimization algorithms developed in the MULTICUBE project and to their surrounding environment. 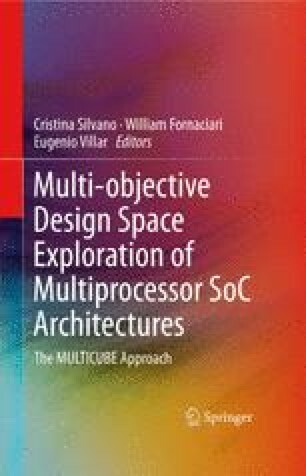 Two software design space exploration (DSE) tools host the algorithms: Multicube Explorer and mode-FRONTIER. The description of the proposed algorithms is the central part of the chapter. The focus will be on newly developed algorithms and on ad-hoc extensions of existing techniques in order to face with discrete and categorical design space parameters that are very common when working with embedded systems design. This chapter will also provide some fundamental guidelines to build a strategy for testing the performance and accuracy of such algorithms. The aim is mainly to build confidence in optimization techniques, rather than to simply compare one algorithm versus another one. The “no-free-lunch theorem for optimization” has to be taken into consideration and therefore the analysis will look forward to robustness and industrial reliability of the results.